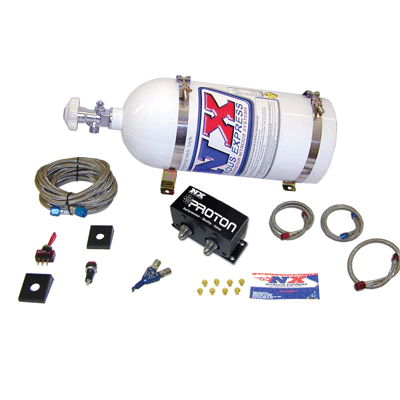 Proton Series nitrous systems combine performance, durability and value in a compact and easy to mount module. Proton systems contain high quality, made in the USA, solenoids that are capable of producing 150 horsepower to the wheels. The black anodized aluminum housing not only looks great, it pulls heat away from the solenoids for extreme durability. This Proton system includes jetting for 35HP, 50HP and 75HP. This system also includes a 10lb nitrous bottle with a chrome high flow bottle valve, stainless bottle brackets, a single Piranha nozzle, stainless braided nozzle lines, extra long braided stainless feed line, master arming switch and a push button. Fits all electronic fuel injected vehicles with a single throttle body.